With the last days of summer ahead of us, I'm trying to hold onto my tan as long as possible! I'm of Pacific Islander (Filipino) descent, so I usually have somewhat of a tan year round. However, my skin does tend to get a bit sallow as it fades into the colder months. I no longer use tanning beds (yes, I used to do this before, I know I'm bad) and don't really lie out to tan. I'm trying to preserve my skin and avoid sun damage. As a result, in the last year or so I've been relying on Sunless tanners to give me that coveted bronzed glow. 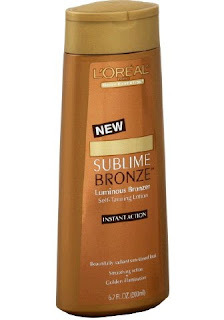 I've been using Jergens Golden Glow express for a while now, but I had a chance to use a new product, L'oreal Sublime Bronze. When I first tried this, I was surprised because it's so different from the Jergens version. This one actually comes out like a Brown Gel with gold glitters. My Jergens came out like a normal, white colored lotion. I prepped like I normally would by showering and exfoliating all over. I then like to rub this into slightly damp skin. After first application I noticed a huge difference. My skin looked nice and bronzy. The lotion leaves pretty gold shimmers onto the skin - bonus! A few hours later, I did a recheck and noticed a little bit of streaking - uh oh! I reapplied the product the next day and the difference is that I made sure to rub the product in until it was completely dry. Then I was streak free! My glow has lasted a while, I'm pretty impressed actually. The product instructions state to use this daily until you achieve your desired color, and then use once a week to touch up. -if you don't like shimmer and gold flecks, this isn't for you. I really like this product. I think this will replace my former HG Jergens Global Glow. The bottle is also much bigger and I find that the product lasts a lot longer. I'm definitely using this for my bestie's wedding on October 2nd with our tea length bridesmaid dresses. Matter of fact, i'm using this year round. I would definitely recommend. nice lotion,not sure if Malaysia got it. Oo sounds like a good product i'd try thanks! thanks for the review :) i've been looking for a self tanner that actually works on darker skin tones. cant wait to try this out. tI have this in the wipes. Do you think it works the same? I have also been usins Aveeno moisturizing lotion w/hint of color & the new dial up one. Love the blog & ow really outgoing you are! I never use self tanning lotion before, therefore I am clueless about them. U should take a picture of you to see the result. Does it make u look orangish?? Or does it make u really dark.